If you find yourself losing control around food and falling into a frenzy of secretive eating, you might well wish that this is going to be the very last time. Never again you vow, as you bring down the hatchets of self-control and discipline, reining yourself back into your ‘good eating’ patterns with a renewed resolve. And maybe it starts out so successfully at first? The super-light breakfast of fruit and yoghurt, followed by the welcome hunger pangs later that morning as you know you are finally getting this food thing sorted. You feel lighter, clearer and focused. Food is fuel. No longer do you need to eat the tempting office cakes or Mum’s creamy dessert. And this period of eating control may go on for days or weeks or even longer. Then one day, out of nowhere, you find yourself tumultuously falling off the cliff into the valley of the binge. It started with an itching, nagging, feeling of deprivation, as if something was missing. You couldn’t stop thinking about food. Temptations everywhere, taunting you. Then, the argument, accompanied with feeling anxious, tired, stressed and wham bam, you had suddenly demolished three biscuits from your kitchen cupboard in seconds. How did this happen? Suddenly, everything after this is a blur. Nothing matters more than finding more food and satisfying this insatiable craving. Within a few minutes, you have eaten chocolate, pastries, cereal, croissants, bread – every single thing that you have avoided with an iron-rod will for days. Very fleetingly you feel euphoria and release from eating. Soon afterwards, the black, looming cloud of shame descends and the reality of the situation sinks in. What have I done you think? Guilt, self-loathing, and disgust linger. You feel fat. You feel unattractive. You feel greedy and ashamed. You feel very alone. You want to stop. You are not sure how to do this. It is unusual that binge eating begins out of nowhere. It is likely preceded by dietary restraint. Delaying eating – ‘I’m not hungry now; I’ll just wait a little longer’. Eliminating food groups Eg: ‘Carbs are the enemy’; ‘I must eat 100% clean’. 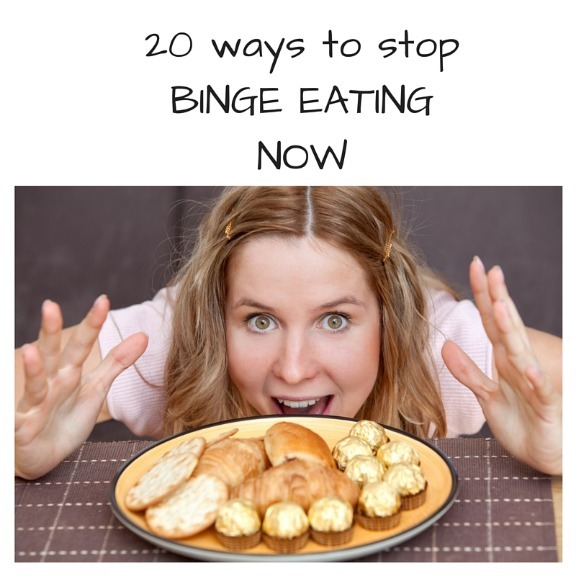 If you binge eat regularly, you will likely see dietary restraint as the solution. ‘If only I could gain control of my eating, it would all be okay’. You try to gain control, by introducing ‘RULES’: - calorie limits; food types to be eaten or precise quantities to eat. This thinking is seductive offering the allure of the perfect eating plan. It is also faulty thinking though. We know from starvation studies Eg: Minnesota in World War II, that when the human body is deprived of food, bingeing is often one of the inevitable outcomes. This is along with a constant preoccupation with food, tiredness, feeling cold and poor concentration to name a few. When you deprive your body of the energy it needs to survive and maintain proper function, it will scream out for this deficit to be replenished. You will crave; you will dream and obsess about food all day long. This has an evolutionary survival advantage for us. Our ancestors would have been regularly faced with fluctuating availabilities of food. We are programmed to restore the deficit of energy experienced in the famine when food is then available in the feast. Your body will fight back. You can become stuck in a diet – binge cycle. You might feel very uncomfortable with giving up the notion of dieting as feel that you are overweight or need to change your body shape. You probably see dieting as the solution to weight loss. We know that dieting is not a sustainable means to achieve weight loss though. Numerous research studies evidence the fact that diets don’t work long-term. In the short-term (weeks) diets might appear to be successful. Long-term they disrupt your metabolism and slow it down. They interfere with your natural hunger, as you ignore your body signals and follow outside rules. They can damage your relationship with food. If they were really so effective, why are there so many ‘new diets’ constantly on the market? Your body needs fuel to work effectively. If you are not eating enough to sustain metabolism and body functions, you will be hungry. You will also be vulnerable to experiencing low blood sugar, which can result in powerful cravings and you will find yourself searching for food. You might desire foods high in sugar as your body screams out for instant fuel. Dietary restraint commonly can result in you getting over-hungry. You are then vulnerable to over-eating as your body attempts to restore balance. If you aim to keep your blood sugar stable throughout the day, then the physical urge to binge will be significantly reduced. Eat regularly; 3 meals and 3 snacks throughout the day. Establish a routine and eat at your planned times. Include slow release carbohydrates and protein at your main meals to avoid blood sugar surges. Ensure you eat enough good fats. Fats are filling and will increase your satisfaction factor from food. If you eat something very sugary, aim to eat after a main meal rather than on an empty stomach. This will reduce blood sugar surges. Avoid diet drinks as they can play havoc with insulin levels. If you completely ban certain foods and see them as naughty or forbidden, you will want to eat them more. If you have ‘good foods’ and ‘bad foods’, this dichotomous thinking might also trigger the ‘I’ve blown it effect’ if you eat something ‘forbidden’. To change this, you begin to allow all foods to be genuinely permitted in to your eating regime. Short-term you might feel terrified of doing this and want to gorge on certain foods. This is a natural backlash against deprivation. It is temporary. Long-term, this will not continue, as long as you stop dietary restraint. I speak from experience. If you are allowed as many chocolate muffins as you desire, the appeal of them somewhat lessens! To avoid overwhelm with this task, introduce previously forbidden foods back into your normal regular eating routine only one food at a time. As you gain confidence with your eating, start to listen to your body. Trust that as you begin to tune in, that your body will tell you what it needs. Binge eating is often carried out on the run; at the cupboard door; in the car or at the fridge. It is often a dissociative and trance like experience. You might not even fully taste the food or notice the experience of eating. When you eat, ensure you are calm and relaxed before eating. Take some time to be quiet and slow down your breathing. Set a place and make it look attractive. Then, sit down and eat at a table. You might also eat with others if you find this helpful. When you eat, savour each mouthful by eating slowly and chewing your food well. Be mindful of the eating experience. Notice the flavours and subtle tastes and textures. How much do you enjoy the food? Do you feel satisfied by the eating experience? Sometimes when you eat, you may be tempted to eat more. This is the time to get away from the food source and distract yourself with an activity that is relaxing or absorbing. If after 20 minutes, you still feel genuinely hungry, then return to the table and allow yourself something else to eat. If you have a craving to binge, ride the urge like surfing a wave. It will rise and fall. It will pass. This is a fantastic tool to help you gain valuable understanding and insight into your eating behaviour. You record the food eaten; the time of day; where you are; hunger levels; along with feelings; thoughts and significant events. You may have kept diaries before that were very food focused. This is different. It is helping you to understand your relationship with food so you can begin to have better self-awareness. Once you gain awareness, you are in a stronger position to consider change. What are your personal triggers? You might not know right now. You might feel lost in a fog of bingeing having little clarity or direction. The diary can help you to understand your triggers. Getting on the weighing scales. Learn to understand your own unique triggers. Do you eat when you are anxious? Do you eat when you are scared? What is it that you really need in these moments? Do you really need food? How do you deal with your feelings? Can you name them? Can you respond helpfully to them? Can you reach out for help? If you find this area particularly tricky, counselling can offer a safe place to begin to explore your emotional world and make sense of it. With 60,000 thoughts + a day running through your mind, and many of these being repetitive, you will understand the power of your thinking. Our thoughts, mood and behaviour are all interlinked. ‘People are looking at me’ – ASHAMED – withdraw from others. Becoming aware of your thoughts can be an illuminating process. You can learn to accept your thoughts and not act on them. You can learn to challenge your thoughts and be kinder to yourself. You may be very unkind and punitive in the way you talk to yourself. You may be punishing and critical. You may feel that you never meet your standards. Being judgemental and unkind doesn’t really help you. You might hope that it will drive you into action. Usually, it simply demoralises you and keeps you stuck and helpless. Think about how you can be kinder to yourself in your thoughts, actions and behaviours. Maybe you have slipped into the habit of being kind to yourself by using food as a reward. Perhaps food has become your number one pleasure? Seek out other ways of finding pleasure and feeling good. Sometimes you might choose to use food as a reward. However, it is helpful to have a whole repertoire of other strategies to fall back on too. Don’t always put others first. Spend time with people that are your cheerleaders and will support you. Saying yes, when you would rather say no can lead to resentment and burn-out. Learn to say no with kindness and firmness. Develop assertiveness skills. If you feel guilty saying no, question if this is appropriate? Where does it come from? Do you really need to feel guilty? Learning to say no can have powerful consequences for your eating. Getting on the weighing scales can often trigger bingeing. Judging your self-worth on a number can make it an impossible battle to win. If you gain weight, you might feel bad and self-punishing. If you lose weight, you might feel anxious about maintaining this, or may eat to reward your good progress. Only weigh yourself occasionally. Judge your body by how your clothes fit. If you are striving to achieve a weight that is unrealistic for your body frame, then you are going to be caught in a dangerous trap. Would you rather be a healthy weight and symptom free or slimmer and binge eating? Think about your choices. If you struggle with this, find ways to work on and improve your body image. If you are struggling and feel out of your depth to cope alone, then it is a brave and courageous step to seek support. It is unlikely that the binge eating problem will just resolve itself miraculously. It could get worse. Be brave, be bold and reach out. ‘Overcoming Binge Eating’ by Christopher Fairburn. If you like this post, please do share on social media and with your friends. Thank you! ​If you would like to work with me on your binge eating, please do get in touch. I would love to hear from you.